Timur Bekmambetov's Abraham Lincoln, Vampire Hunter continue to play it straight with the release of its second trailer at WonderCon. 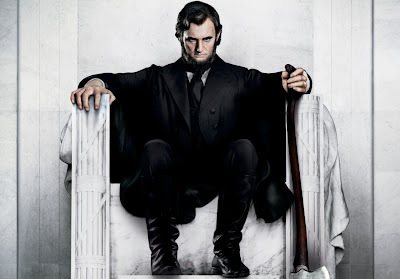 We have earlier witnessed the 16th President of the United States of America in some cool vampire-slaying action in first trailer of director Timur Bekmambetov's live-action adaptation of Abraham Lincoln, Vampire Hunter. Based on the quirky mash-up novel written by Seth Grahame-Smith, the film showcases Abraham Lincoln's secret life as a full-fledged vampire hunter with an impeccable axe-wielding skill. In this second trailer that was recently released at WonderCon by 20th Century Fox, it's more vampire-chopping action as Lincoln continues his stoic vampire-hunting ways. Hit the jump to check out the trailer. Starring Benjamin Walker as Abraham Lincoln, Mary Elizabeth Winstead as Mary Todd Lincoln, Lincoln's wife, and Rufus Sewell, Abraham Lincoln: Vampire Hunter is currently scheduled to be released in 2D and 3D on June 22nd, 2012.